The Trump administration's highly unusual deal to save a giant Chinese tech company is drawing deep skepticism. The United States had banned ZTE, a state-controlled Chinese smartphone maker, from buying American parts, saying it breached a 2017 deal in which it admitted to violating sanctions on Iran and North Korea. That ban, which threatened to put the company out of business, will be lifted under the deal announced Thursday. ZTE (ZTCOF) will pay a $1 billion fine and change its entire corporate leadership. Most unusual, though, is a provision that will allow a US-appointed oversight team to keep tabs on the company from the inside. That arrangement took experts on Chinese business by surprise, and some questioned how it could work. "That to me seems like an aspirational goal," said Scott Kennedy, director of the Project on Chinese Business and Political Economy at the Center for Strategic and International Studies. "I can see this one getting dragged out." Kennedy expects the Chinese government to keep negotiating that part of the deal. And he said he believes the United States may drop the provision altogether rather than get locked in a prolonged battle over it. Derek Scissors, a resident scholar at the American Enterprise Institute, a Washington think tank, said that even if compliance officers were allowed into ZTE, they wouldn't prevent China from violating sanctions. Chinese officials "will just set up another company to break sanctions," he said. Compliance officers "will accomplish nothing." The deal requires ZTE to put $400 million in escrow. If ZTE violates the terms, it will forfeit the money, and the ban will resume. ZTE hasn't yet commented on the deal. The management changes have to be completed in 30 days. But for state-controlled wireless companies in particular, "rotating the top management team is not news," said Minyuan Zhao, an associate management professor at Wharton's Center for the Study of Contemporary China. "Having a foreign compliance officer is definitely news," she said. In Congress, the deal met a backlash from members of both parties, and some vowed to try to block it. Republican Senator Tom Cotton of Arkansas and Democratic Senators Chris Van Hollen of Maryland and Chuck Schumer of New York introduced an amendment to the National Defense Authorization Act that would stop the president from offering ZTE a deal. "ZTE has flagrantly and repeatedly violated US laws," Van Hollen said in a statement. "Any deal to let them off the hook should not move forward." Commerce Secretary Wilbur Ross celebrated the deal and pledged that it would impose "the most strict compliance that we've ever had on any company, American or foreign." "Prior administrations have been real patsies for the Chinese and for other countries. They've never really pushed back," he told CNBC. "So I think the Chinese are well aware there's a new marshal in town, and it's called Donald J. Trump, and he's a very, very good shot." Still, some experts wondered what the United States will get out of the deal. One possibility is that China will finally approve Qualcomm's (QCOM) $44 billion purchase of the Dutch company NXP Semiconductors (NXPI), said Samm Sacks, a senior fellow in the Technology Policy Program at the Center for Strategic and International Studies. Related: What is ZTE, and why does the US think it's a national security threat? The fate of ZTE has become a flashpoint in trade tensions with China as the United States readies tariffs on $50 billion in Chinese goods. The United States is expected to announce the details of those tariffs next week. 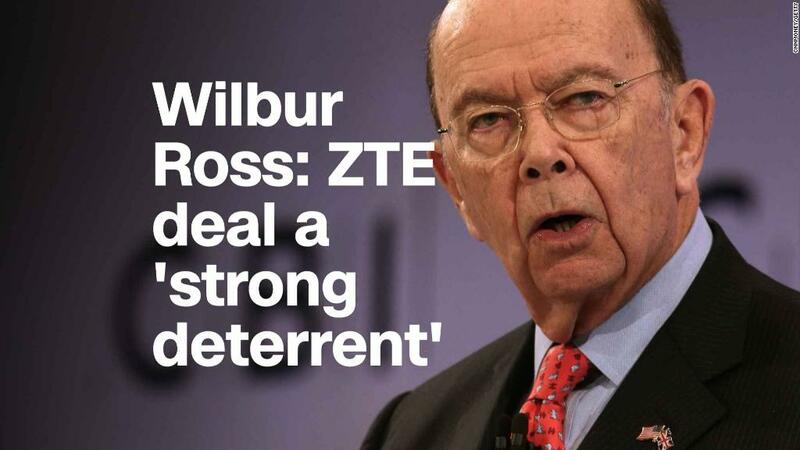 Ross insisted that ZTE deal was an enforcement matter, separate from trade. David Dollar, a China expert at the Brookings Institution, said the ZTE deal was an unorthodox way to correct an overly harsh punishment. "It's probably good that we've reached a compromise," he said. "But it is a bad precedent" to use a regulatory matter as a negotiations tool. "The main thing the US is getting out of this is generating some goodwill" with China, he said.